An October trip to the Smokies was a mix of happy and sad. The government shutdown had closed our beloved Great Smoky Mountains National Park. 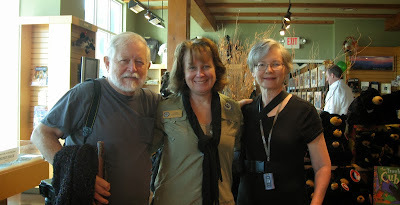 One of our happy times was meeting Lisa Duff, marketing and membership director of the Great Smoky Mountain Association. Her colorful and well done e-newsletter and email updates keep association members, including Husband Walter and me, informed of news and opportunities related to the national park and ongoing projects that the non-profit Association funds for the park. We met Lisa at one of the Association’s visitor centers that was outside the park and therefore not subject to the shutdown. Not so happy was the fact that the government shutdown closed all visitor centers inside park boundaries, laying off more than 40 Great Smoky Mountain Association employees who work the Association’s gift shops. The closures coincided with the fall color season, the heaviest weeks of visitation during the entire year. 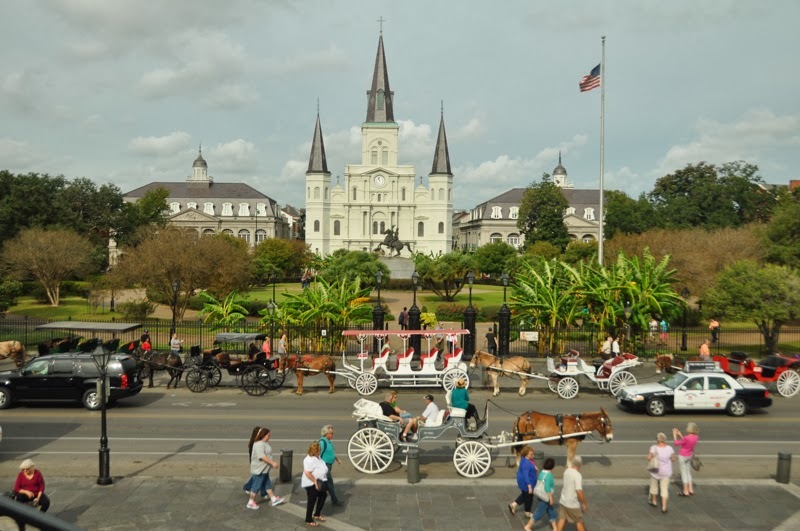 It is also among the busiest gift shop sales weeks and fuels a significant income stream for the Association’s mission to preserve the park and to promote public understanding and appreciation through education, interpretation and research. In addition to the visitor centers inside the park, other closures included our favorite picnic areas, beautiful Cades Cove, most other scenic park locations we like to visit, and Little River Road that is our usual route to the Cove and Townsend, Tennessee. The park was reopened about five days after we headed home, with official Association stores opening, too. No regrets, though, about sticking with our original travel plans. We knew of the closures before we left home, and we arrived prepared to enjoy the many other opportunities to relax and explore in the region. It created a distinctive image of her original desire to record family stories and memories before she forgot them. Now, her reason for blogging is more about online interaction with caring, supportive, interesting people. Today as I savored kind and encouraging comments from readers on previous posts of my own, I was overwhelmed with the continuing positive impact that online friends have made in my life. When I started blogging in November 2009, the reason was so I wouldn’t forget the experiences and people populating my retirement. I had already enjoyed more than a year of that busy new stage in my life. I never dreamed that about 17 months later my retirement landscape would undergo cataclysmic change as the result of a major hemorrhagic stroke. When I tentatively resumed posting after more than a month in the hospital, I assumed the blog’s value to me was the same, an avenue to assimilate and record the events of yet another phase of life. But a far greater value was soon apparent. Throughout the physical, emotional, mental and spiritual ups and downs of my post-stroke life, blogging friends have been a constant. They have been a source of encouragement, prayers and good wishes, good advice and good laughs. Comforting, inspiring and sometimes heartbreaking glimpses of other bloggers’ own mountains, valleys and deserts, seasoned with photos and chronicles of people, places, things and experiences from their daily lives add additional dimensions of meaning to my life, whether through shared celebration or shared sorrow. Even a fellow blogger’s captivating turn of phrase--such as “escaping the memory thieves,” can lift my spirits in a paroxysm of word lover’s delight. Thank you, thank you, my friends. Hooray! I finished this post before I forgot. 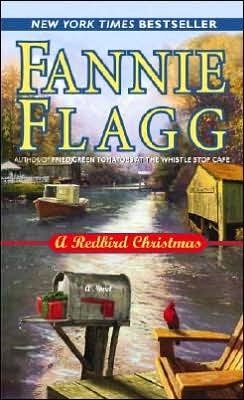 If you are looking for a stocking stuffer for someone who enjoys reading fiction, I recommend Fannie Flagg’s Redbird Christmas. This is a feel-good Christmas novel. A strong cast of characters, including a redbird named Jack, packs its 240 pages. Flagg wields a deft touch in her portrayal of Southern cultures and environments. She also captures the human heart, from heartbreak to healing kindness. Set in Lost River, Alabama, both the residents and life in the small town could have been inspired by scenes from my childhood. There were, for example, my 32 aunts and uncles, all gone now. That included the in-laws grafted into my parents’ families. All of them, except two of the spouses, were native Mississippians who grew up on farms in tight-knit, rural communities. Then there were the colorful characters who were in my life during the time we spent on our primitive houseboat on the West Pearl River in Louisiana. From my pre-school years until Hurricane Camille smashed the houseboat when I was a young married, my family and I spent part of every summer and many weekends at the houseboat. We were accepted as transients in the river culture. Whether fishing, gathering muscadines, visiting or going to Mr. and Mrs. Blocker’s artesian well across the river for potable water, small boats and outboard motors were a part of our life. I treasure experiencing the visit to Flagg’s fictional Lost River, where engaging and amazing events unfold. It was a good read that also resurrected those childhood memories for me. The only regret I have about this book is that in a fit of making room for more books, I turned it into our library’s paperback one-for-one swap section. I may just buy it for my Kindle and read it again during this Christmas season. The first weekend in November is a citywide street party of arts and crafts, live music, food and drink in our small city. The two-day annual Peter Anderson Arts and Crafts Festival has grown from the first celebration by a small group of local artists and friends. Now it includes 400 vendors selected by a jury committee. Organizers estimate crowds at well over 100,000, and we braved the crowded downtown streets this year. I enjoyed soaking up all that beautiful, unusual and even humorous creativity on display and for sale. Vendors were having a great day as people came ready to buy, some pulling children’s wagons or other maneuverable conveyances to handle their purchases. But the only purchase Husband Walter and I made was a bag of Louisiana satsumas. We have reached a stage where we want to simplify rather than add to our home environment. 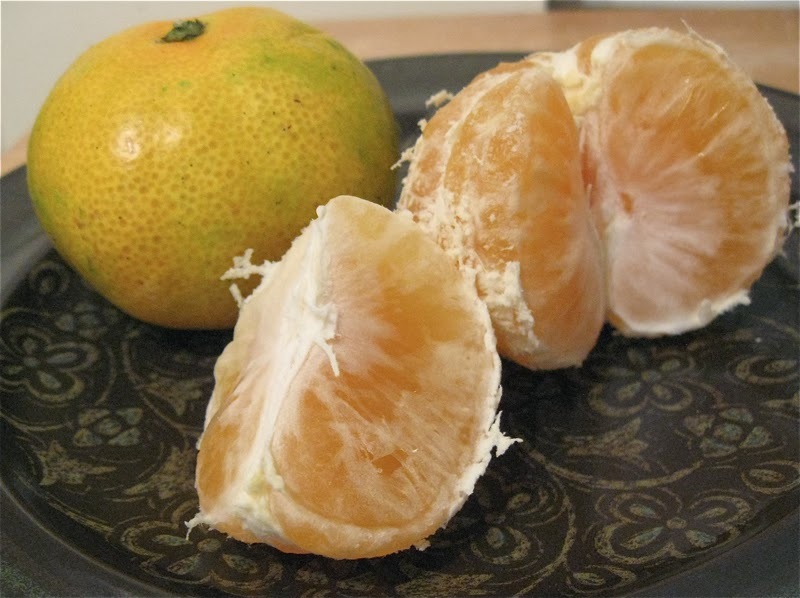 The satsumas were definitely simple. There were no decisions about where to put our purchase or what to move or give away so new stuff would fit. And the tasty citrus disappeared quickly. There was a time when the vendors’ displays tempted mightily. Now, looking is the pleasure and staying upright in the crowds is the challenge. Our changed purchasing pattern is probably another sign of aging. And I am comfortable with that. Courtyards in the French Quarter are high on my list of favorite things about visiting New Orleans. But my interest is limited to about October through April when heat and humidity ease off. On an end-of-October jaunt, Husband Walter and I enjoyed perfect weather for leisurely continental breakfasts in the Hotel Provincial’s courtyard. 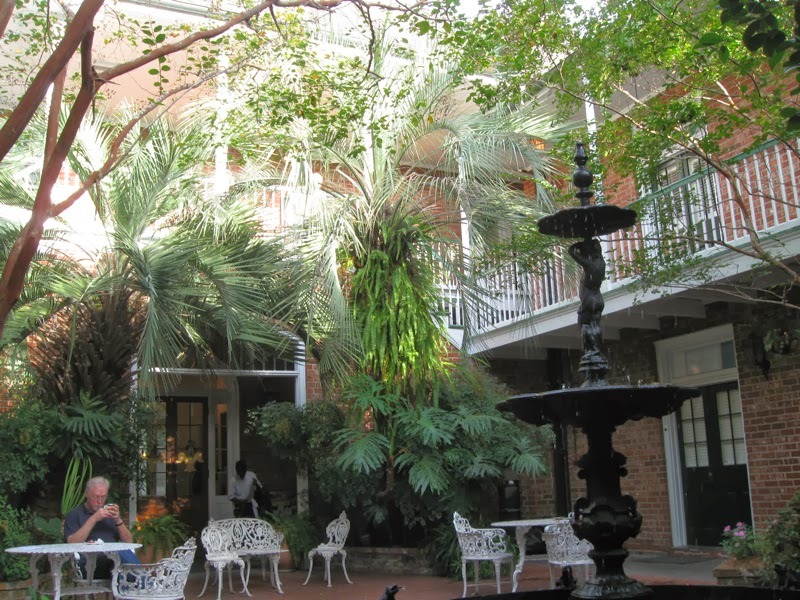 Brief visits to two other courtyards during a guided walking tour of the French Quarter were welcomed chances for me to sit and rest a minute. 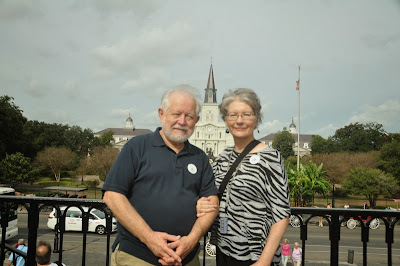 After walking from our hotel to Jackson Square, Husband Walter and I waited in the courtyard of the 1850 House, a typical Creole townhouse, for our historical walking tour to start. Our guide’s description of the small courtyard’s role in the daily life of the townhouse residents corrected some of my assumptions. Nancy was our guide and a Friends of the Cabildo volunteer. She painted a more accurate picture of the courtyard for me. Instead of the leisurely scene I had imagined, the area had been a much used work space for laundry, meal preparation, other housekeeping tasks and even housing animals. 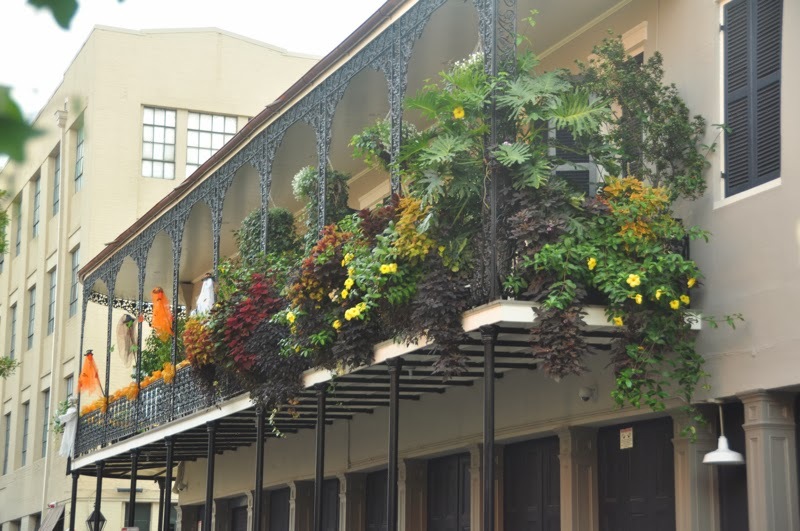 Another French Quarter feature that I enjoy is the abundance of lush gardens on balconies of residences fronting the Quarter’s streets. On our tour I learned that not all of those outdoor living spaces that I called balconies really are balconies. Tour guide Nancy said that a balcony is narrow and sticks out from the building’s wall. It has no posts or columns that reach from the balcony floor to the ground. In contrast, galleries have the posts or columns that give platform-to-ground support. Most galleries I saw were also wider and would overhang the width of the sidewalk. About an hour into the two-and-a-half-hour walk, Nancy invited us into the courtyard of her condo, part of a traditional French Quarter residence converted into two condos on the “quiet” end of Bourbon Street. The blocks nearer the other end of Bourbon Street closer to Canal Street are home to bars, restaurants and strip clubs. They can be calm during the day but turn boisterous at night, especially during Mardi Gras and other New Orleans festivals. 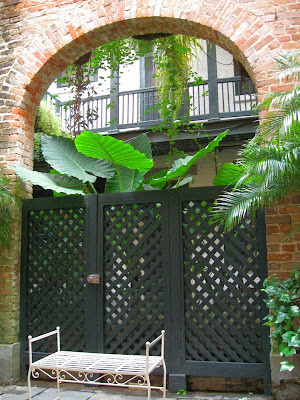 At the end of the tour, I was zapped and chose to tour the 1850 House on another visit. 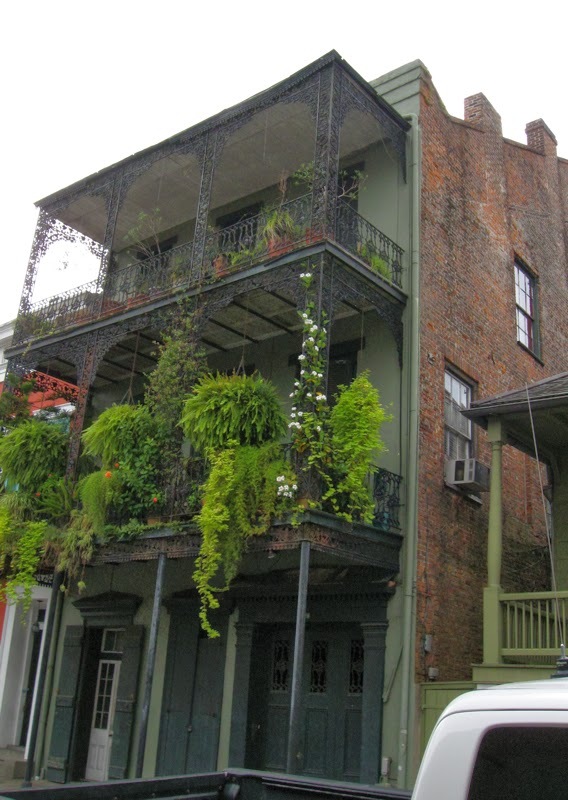 It is the only residential unit open to the public in either of the two historic and picturesque Pontalba Buildings that flank the upriver and downriver sides of Jackson Square. 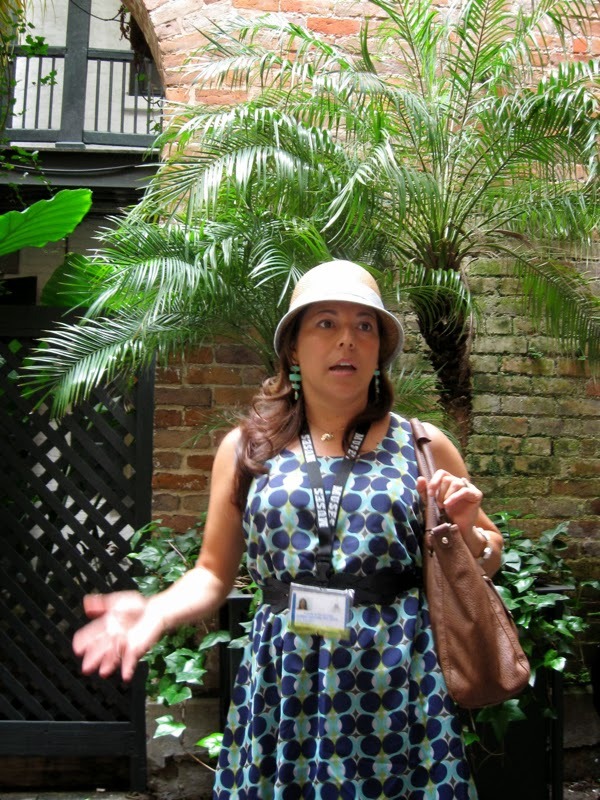 I was captivated by our guide’s knowledge and her flair for presenting the stories of people and groups who shaped the history of the city and the French Quarter. Plus, on our early morning midweek tour, there were only four of us tourists. I have trouble hearing when a group is large. No problem this time. 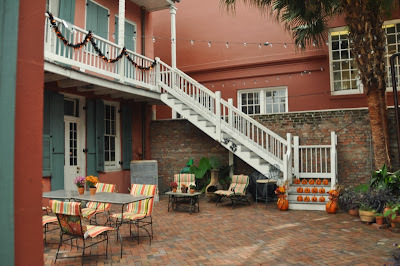 I am eager to sample another New Orleans walking tour and to make our postponed visit to the 1850 House in the French Quarter, maybe after Thanksgiving and Christmas are behind us. My usual approach to blog posts and daily life is to dwell on the blessings, the bright side. 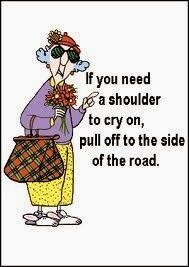 That approach has not been difficult for the most part. But in the interest of honesty and a hefty dose of self-interest as well, I am admitting to a recent downward spiral that has sent me AWOL from the computer, from blogging, from consistent at-home, self-administered therapy, and from my ever growing to-do list. During this attack of inertia I have not taken up permanent residence in the Swamp Dismal. At least, I hope not. Fun, laughter and interaction with loved ones have supplied delightful interruptions in this trek through the swamp. And I have posts started about those times, but right now they are left languishing unfinished in my laptop’s drafts file. Retirement Daze is my memory bank, and I am hereby abandoning my attempts, largely unsuccessful anyway, to avoid posting about my detours into feeling overwhelmed and in the dumps. Acknowledging those periods and the slogging through Swamp Dismal to higher ground are part of my journey as my stroke recovery continues. Blogging is cathartic for me, and embracing the low points as well as high ones may help reduce the occurences of inertia and help me stay focused on figuratively and literally continuing to put one foot in front of the other. And that realization is worth the detour through the swamp. I’m not on that high ground yet, but this post is a start.